Due to differences between monitor displays,actual color may vary slightly from image. Please allow the smell in the course of packing and shipping,but it will be disappeared in a few days air out. 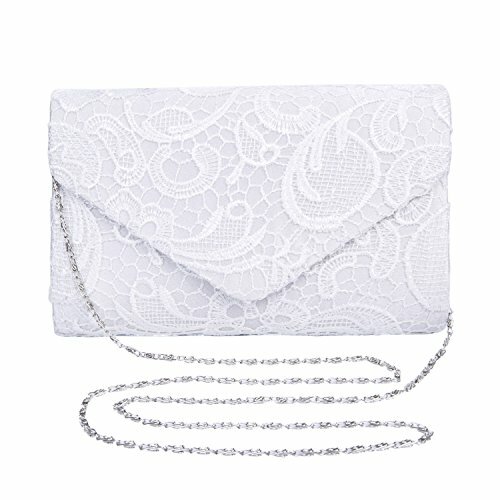 Design - This fashion lace evening clutch makes you a elegant and noble,it's a good holiday gift. Capacity- It's a super fashionable evening clutch that fit everything you need (iphone 7plus,iphone8, cards,money,car keys,small wallet,mirror,lipstick,some makeup etc). Carrying Options - You can hold this evening bag in your hand or you can also use it evening bag,handbag,cross-body bag,shoulder bag. Occasions - This clutch purse Suitable for Night Out,Wedding,Evening,Date,Dinner,Cruise,Ball,Prom,Formal Occasion,Activities or Party etc.It is a perfect christmas gift for your friends or colleague,the best choice for Christmas Eve presents. If you have any questions about this product by Kaever, contact us by completing and submitting the form below. If you are looking for a specif part number, please include it with your message.